Description: Kevin primarily collects bobbleheads from the Milwaukee Brewers and Milwaukee Bucks. Other Information: Kevin enjoys going to games and the bobbles started to pile up in storage. In 2012, he and his wife bought a house and now he can display them in the basement. 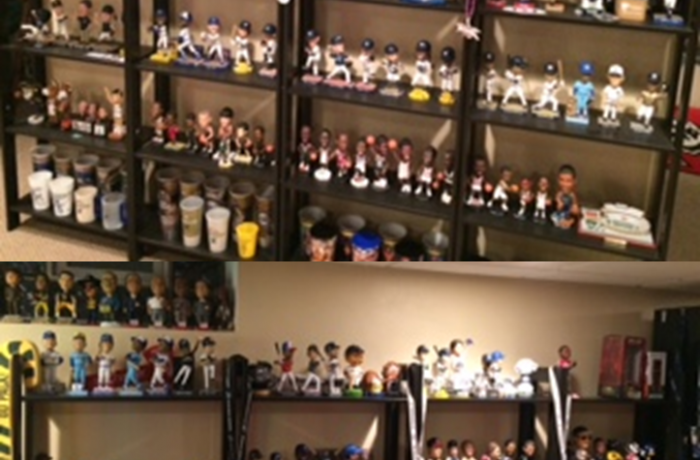 Since then Kevin has expanded his collection through friends, eBay, and going to other events that have bobbleheads. He has recently added some nice minor league bobbles to his collection. Kevin plans on continuing his collection until he runs out of space!